Optimism, Pessimism, or - Realism? An article written by APN's Ori Nir, published in today's edition of the Boston Globe, reminds us that the realistic attitude -one endorsed by all six of the most recent leaders of Israel’s General Security Service (Shin Bet) - is the one that advocates a two-state solution. Americans for Peace Now works to advance Arab-Israeli peace and to highlight that such peace is not only necessary, but also possible. 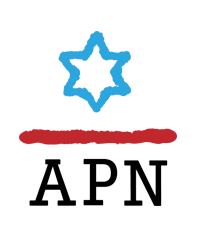 Support APN's message of peace and a two-state solution. Those of us who care about Israel know that the coming year will be a critical one in determining Israel’s future character. Will Israel pursue the xenophobic vision of the nationalistic extreme-right? Or will it pursue a progressive vision, reflecting the values of its majority -- Jewish values of peace, pluralism, and democracy? Recently, many were dismayed to discover (as reported in the Forward and +972) that the iconic photo of two young boys, seemingly an Israeli-Jewish child and a Palestinian-Muslim child, was a posed photo taken for the Canadian magazine Maclean’s. Yes, that photo was staged, but there's no need to indulge in the despairing laments echoing around the internet: there are plenty of real pictures, of real people - Palestinian and Israeli (and two Jewish-Americans, in day five's picture - APN's own Lara Friedman, and in day seven's picture, APN Founder Mark Rosenblum), Jewish, Christian, and Muslim - working for a brighter future. In the spirit of Chanukah, we shared a picture a day on Facebook and twitter for each of the eight days of Chanukah - - of real, genuine partners for peace. Well, the internet exploded: hundreds of shares, thousands of likes. It seems that there is a hunger for hope. And, with your help, we can provide that hope. 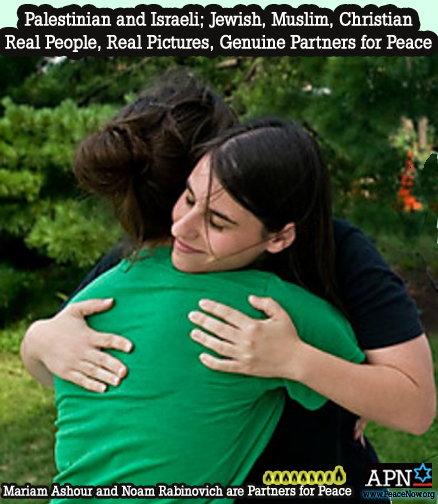 Share them and join us in building a peaceful future. At the darkest time of winter, Jews celebrate Chanukah, adding one candle each night to increase the light. Many of us place our menorah in a window in fulfillment of the mitzvah to “publicize the miracle” of the small cruse of oil that contained only enough for one day but lasted for eight. This particular winter is an especially dark time for those of us who have been working for decades to support a two-state solution to the Israeli-Palestinian conflict. There’s no denying that the peace process has stalled. The parties are not talking to one another. The Occupation continues unabated. We read of growing violence. Some people have even begun to question the possibility of a two-state solution. I know that the headlines are terrible, and that people are throwing up their hands and feeling defeated. "The two-state solution is hopeless," they say. "We will never have peace." There is a new West Bank development nearing completion that I think you should know about. I say that because it can advance the cause of the two-state solution to the Israeli-Palestinian conflict. Have you ever seen a film and thought, "If only everyone could see that! People would start to think differently..."
Recently, you may have received a letter from Dror Moreh, the award-winning Israeli filmmaker of such a film, called The Gatekeepers. Moreh wrote this letter for Americans for Peace Now, the U.S. sister organization of Israel's peace movement, Shalom Achshav. This documentary film features all six living former leaders of Israel's Shin Bet security service, each of whom advocates a position they share with Shalom Achshav: that Israel must reach a negotiated peace agreement with a Palestinian partner. The letter was very successful - we were flooded with messages from people who wanted to see this incredibly important film and support the work of APN and Shalom Achshav.